Anyone who is a regular social media user has probably not only heard but also memorised the lyrics and choreography to the next viral song that is taking the internet by storm. The PPAP song brought by a persona named Piko-Taro created by Japanese comedian Kazuhiko Kosaka has managed to grab the attention of millions around the world, quickly becoming the next web sensation. So of course many brands leveraged of this hype and incorporated the PPAP craze into their advertising. 12 companies that we’ve come across have tried to leverage in on the trend. Some may have been more effective than the others, so here’s what we think. 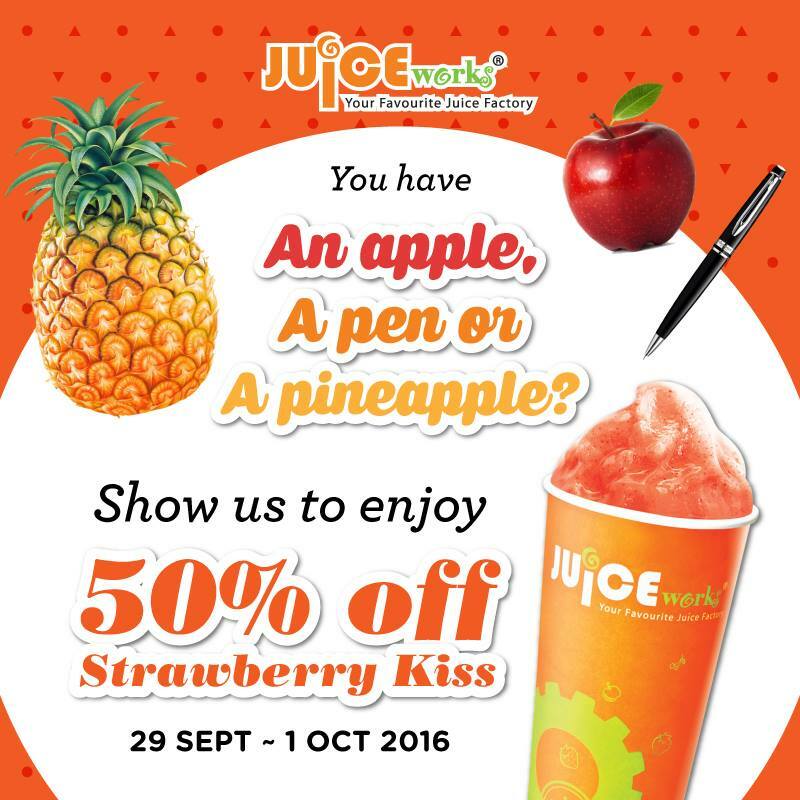 Juice Works stays true to the lyrics of the song by offering a deal for those who are able to show up at any of their counters with an actual pen, apple or pineapple to enjoy a 50% discount on their Strawberry Kiss beverage. Offering a deal is always a good way to get people to jump in and participate, so thumbs up. What better way to ride on a trend than use it to promote one of your signature dishes? 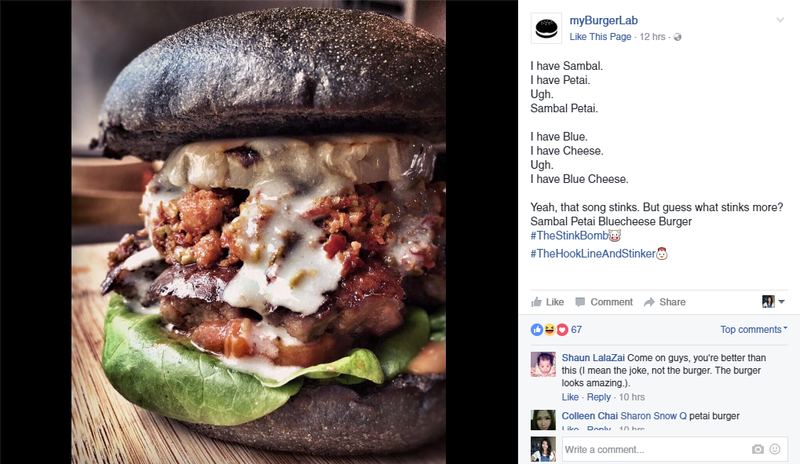 This is what myBurgerLab chose to do by changing up the lyrics of the song to fit the ingredients of one of their best-selling burgers, The Stink Bomb. The joke may be “stinky” but that’s in-line with their product. So the next time you find yourself going down to their restaurant for one of these, don’t be surprised if you happen to have the lyrics playing in your head. Tesco Malaysia uploaded a quick humorous video of one of their employees going around the store and actually showing off the products as depicted in the lyrics, prompting the public to purchase their ‘PPAP Starter Kit’ at their establishment. Judging by the views, netizens are enjoying this video, so it’s achieved its goal of reaching its audience. Thumbs up. Financio sums up the goal of their startup with this simple image of stills compiled from the PPAP video. 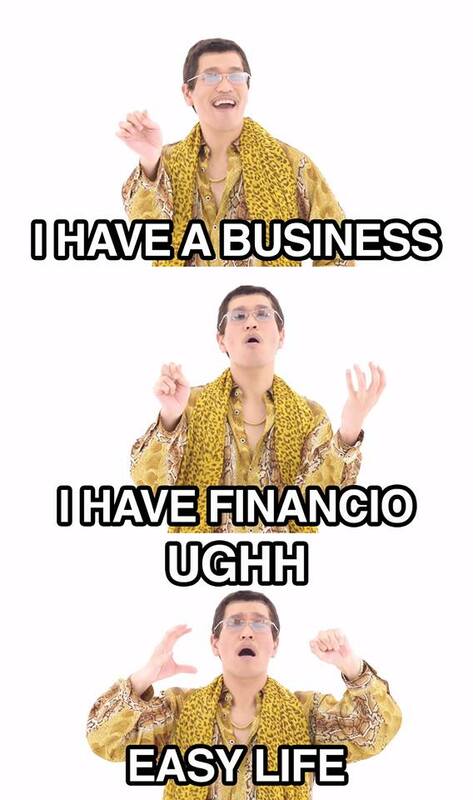 Tailored towards Malaysian businesses by providing easy accounting and invoicing solutions for small businesses, they tried to get on the PPAP hype train and leverage off of it with this image. Good attempt at a summary of what they do. Many people entranced by this Internet sensation consist of students, so SEGI College Subang Jaya decided to take advantage of the fact that they had an amount of young people who would be happy to participate in this viral hit. 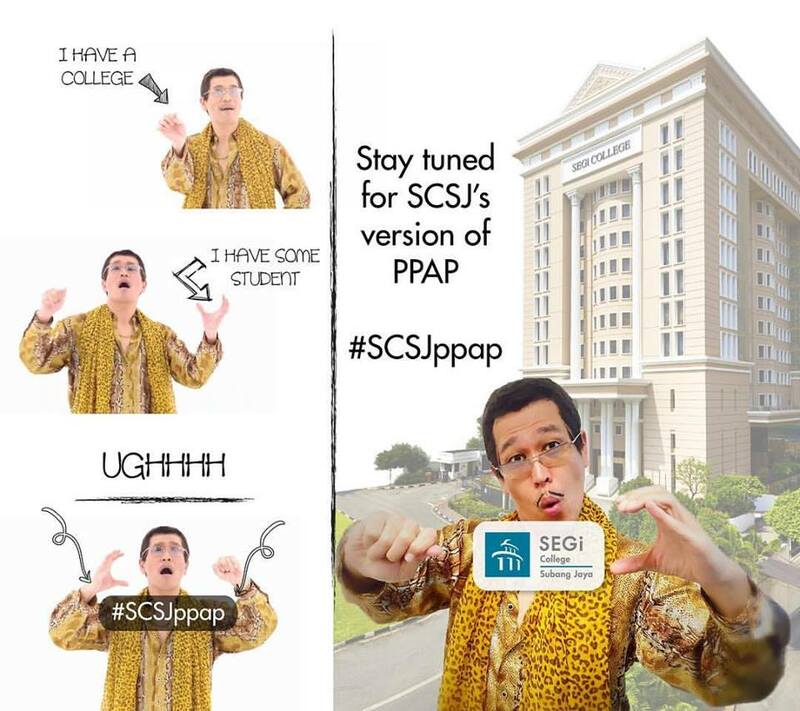 People can keep track of their #SCSJppap progress through their official hashtag. SEGI’s hashtag is unfortunately not very catchy, so good try on being hip but the wording could have been better. 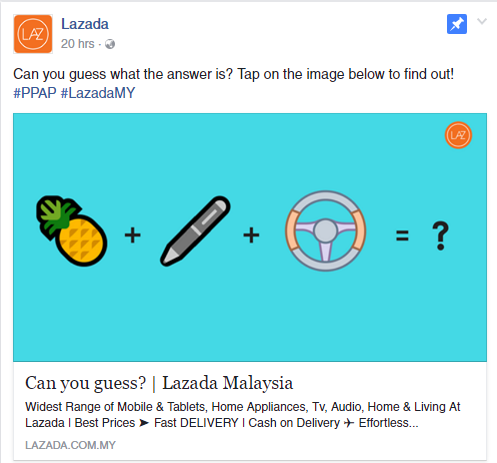 LAZADA is known to have great deals so to coincide with this PPAP phenomenon, they’ve compiled a list of their products that consist of Pineapple-themed items. From flash drives shaped like a Pineapple to a Pineapple slicer, those who are fans of that fruit shouldn’t be missing out on this. Lots of people like pineapple-themed merchandise, perhaps thanks to a certain sponge who lived under the sea, so this promo gets a thumbs up. So now’s the time to ask yourself, which team do you belong to? 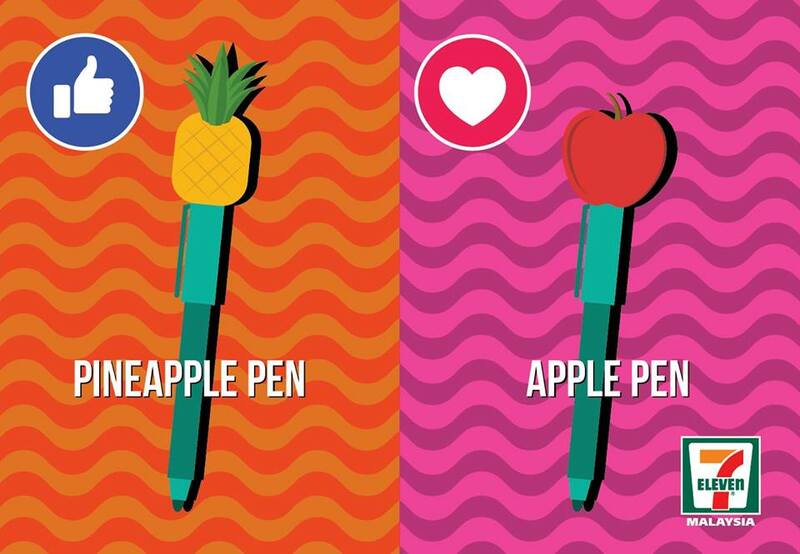 #TeamPineapplePen or #TeamApplePen? That’s the question 7-Eleven asks as they engaged with their Facebook fans through this image. In case you were wondering, judging by the comments left by the public on their post, it seems pretty equal for now. Creating engagement on their page is a plus definitely, so thumbs up. 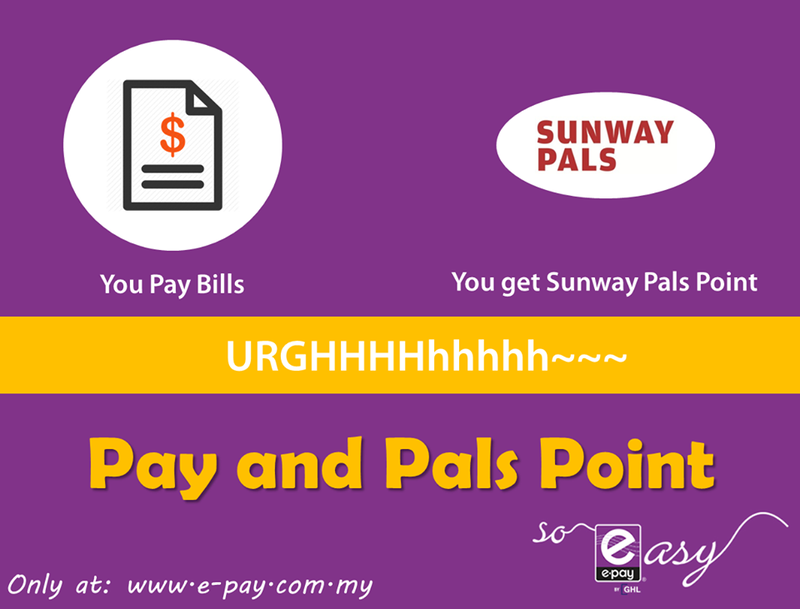 e-Pay makes use of this trend to expound on their deal of paying bills at their e-pay online store and in return, get points from Sunway Pals. Toying around with the acronym, instead of PPAP, why not PAPP which stands for ‘Pay And get Pals Points’. We give them a good effort since they managed to keep to the same letters in the acronym. Another brand to play around with the title of the song, EasyParcel summarises their procedure smartly by incorporating their line of business with PPAP. The acronym fits, so thumbs up here. ASUS shares an interesting short animated video to promote their latest product which is the ASUS Vivostick, which they combined with an apple and a pineapple to see which one looked better. We like the use of the cute graphics to change things around. Thumbs up. Offpeak.my has always been up to date with latest trends, this time’s no different. The video shows a man changing the lyrics to juices instead of a pen to promote nearby Offpeak restaurants to get these juices at. The ending with the Japanese commentary was a nice touch too. Well produced videos are great, so thumbs up. We’re not sure if this video is officially Prudential-sanctioned, but Kendrick Kang on Facebook uploaded a short video of himself singing to the tune of the PPAP song and promoting the Prudential brand. This might lack the sleek production value of the other videos, but it’s certainly engaging. It might be his enthusiasm and facial expressions that have made this go viral but it’s also a smart tactic he used for his job. 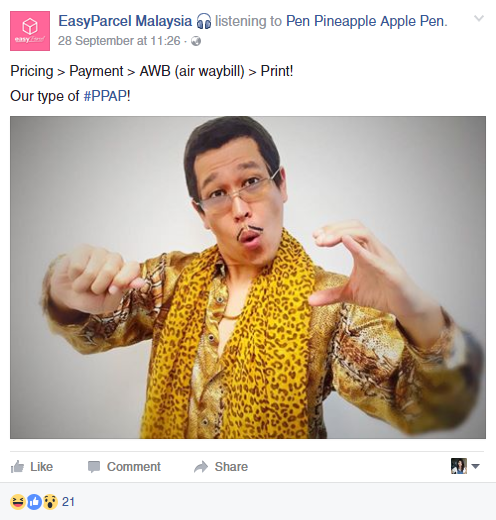 Are there any other PPAP-influenced marketing tactics you’ve seen other Malaysian brands do? Let us know in the comments below.